‘Beast from the East’ is no match for Aycliffe school! A primary school in Newton Aycliffe remained open all week despite the so-called ‘Beast from the East’ battering the UK. As hundreds of schools across the county closed their gates last week, staff at Vane Road Primary School did all they could to ensure the site would be open as usual. Staff travelled from as far as Crook in slow moving traffic with heavy delays as Storm Emma took hold, many staff members gave up on their cars and walked into school. Mr Wilson (site manager) and Mr Patrick were working from the early mornings clearing the paths and entrances in to the school so that the children could attend safely. Head teacher Kieran Pavey said: “The decision to keep our school open was not an easy one to make. Despite the snow fall, students made their way in to school all week and even celebrated world Book Day on Thursday, arriving dressed as their favourite book characters. Parents have praised the decision of the head teacher with many taking to social media to congratulate the Durham County Council school on a gallant effort. Appearing on BBC Newsnight, Geoff Barton, from the Association of School and College Leaders, explained that one of the major factors that head teachers must consider when they are making a decision about the weather, is child safety. 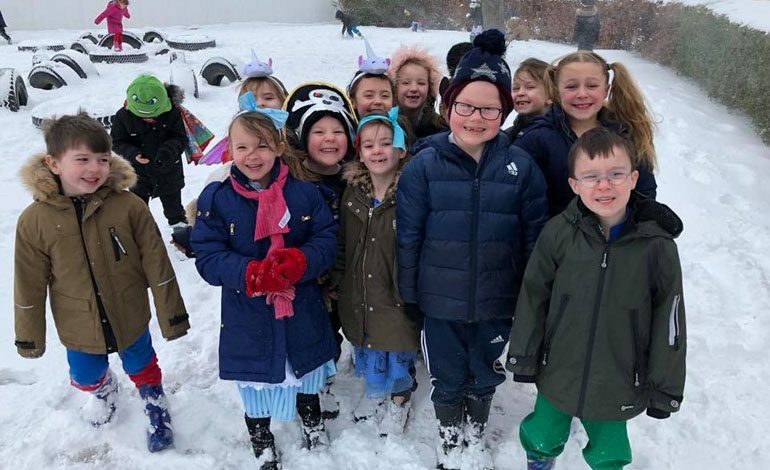 Mr Pavey added: “The children have thoroughly enjoyed their usual lessons as well as being able to enjoy the snow during break times. We allowed for extra time arriving in to school each morning, ensuring the school was also accessible. As the only school in the town to remain open this week and not wanting the children to miss out on the fun that can be had in the snow, staff took part in a teacher vs children snowball fight, to the delight of all the children competing on the playground. The school which has 398 pupils is set to open a new purpose-built facility in the summer. The development has suffered some delays this week given the stormy weather but work will resume on Monday with contractors Kier ensuring the project will remain on schedule.